Don’t read this unless you’ve already read all of Shearwater! I’d used up all my magic. 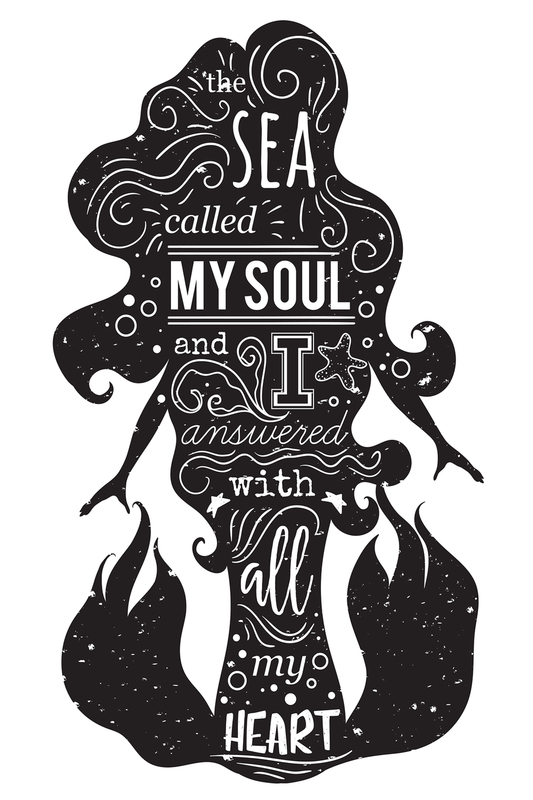 As I sank deeper into the dark ocean, the sparkling lights around my body dimmed. I was done healing—but I was also out of air. My blue dress trailed behind me, the thin fabric billowing in the water, a rainbow colored sheen of scales that reminded me of a peacock. Wait, what? My eyes widened as I tried to kick my legs, and saw only the magnificent tail that wrapped around my lower body and sliced cleanly through the water. I gasped and felt the sea water rush into my lungs. The pain was unbearable as I filled up with ocean. After all these years, I was finally drowning for real. Rather than dying, however, I felt oxygen reenter my blood stream. It felt like a glowing flame, spreading through my body, making it stronger. A surge of energy hit me and I realized I’d finally changed. I was a mermaid, a real one. But now I was chained to a massive chunk of stone that was sinking to the bottom of the ocean. I wondered if I’d end up like that seal, trapped and starving to death. A casualty of human greed. But then, I saw a pale white figure swimming towards me through the endless abyss. It had been so long since I’d seen him, I was sure I was just hallucinating after my traumatic experience. But when he smashed through the restraints and ripped open the metal cuff around my neck, I knew he was really there with me. Sebastian. Somehow he’d gotten my message. I started sobbing, from relief and exhaustion, as he carried me to the surface in his powerful arms. I couldn’t stop admiring my tail. It was dark green and purple, with flecks of blue and gold that sparkled like glitter in the sun. “If you keep smiling so much, your face might get stuck like that.” Sebastian said, pulling his upper body out of the water and splashing water at me. We were on the rocky island off the coast that I’d begun thinking of as our island. It was so small it didn’t have a name, and wasn’t on any maps. It had been three days since I single-handedly destroyed one of Ireland’s most famous historical icons. Of course the media thought it was some kind of localized earthquake. The truth was much harder to believe, even for those of us that knew magic was real. After Sebastian brought me back to land, he let me dry out until my tail was eggshell-thin, then snapped it off in pieces like he was unwrapping a present. The salt water healed my wounds, but I was weak from blood loss and barely conscious. He and Aedan tucked me in and I slept for sixteen hours. When I woke up, Sebastian was at my side. “Where were you?” I demanded, a single tear dripping down my cheek. He brushed it away with the back of his finger. On the second day, the coast guard recovered the body of Father Murphy. He’d washed up on shore missing his leg—it looked like a shark had taken more than just a test bite. Since he was fully clothed, they assumed he must have been in the castle when it collapsed, though nobody could guess why. I was glad he wasn’t a threat anymore, but I knew we hadn’t heard the last of the Worrem. I spent all day swimming with Sebastian and filling him in on what he’d missed, which wasn’t actually that much. Then in the afternoon we met up with the others at the Runkerry house. Jackie made Ethan come look for me at Aedan’s when I didn’t show up at her place. After Sebastian brought me home, Aedan let the others know I was okay, but they were still anxious to see me. “I’m sorry I ruined the debs ball,” I said after Jackie, Patricia and Derry had given me long hugs. We cooked hotdogs on a grill over an outdoor fire and celebrated our victory. I told the others that Father Murphy had been the one after me from the beginning. Aedan looked crushed when I exposed Helena’s involvement, but he tried not to let it show. We all knew this wasn’t the end of our problems, but we were going to enjoy the win while we could. There was no telling how long it would be before we got another one. I nodded. So what if I had a target on my back? I was both Tuatha Dé and Merrow, and soon I’d be at the center of a conflict that just might consume civilization. But I wasn’t the same girl I’d been when I came to Ireland. And I wasn’t alone anymore. 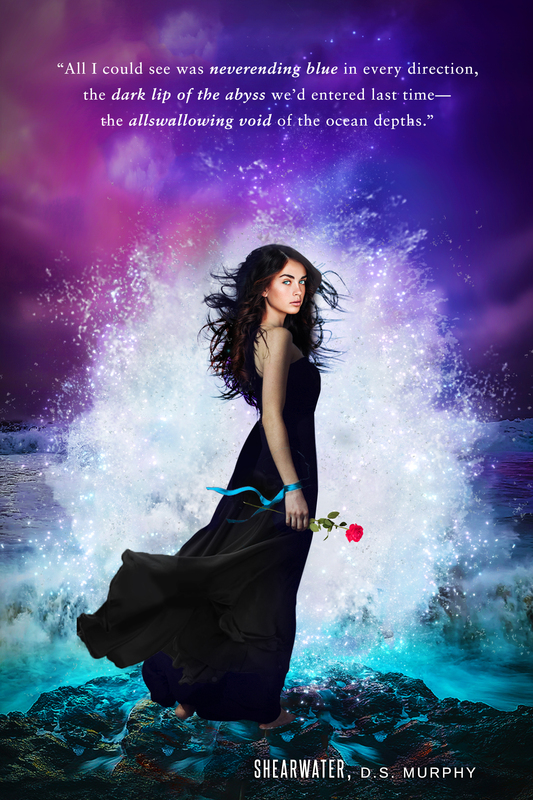 Looking around at my friends on the beach, their smiles illuminated by the campfire, and standing with Sebastian as the sky turned purple and the sparkling stars reflected on the dark waves, I felt something I hadn’t felt in a long time. Something I wasn’t sure I was ever going to feel again. Hope. When my parents died, I tried to shut the world out so. I didn’t dare dream about a future where I could be happy again. But then I met Sebastian, and now I had friends and family who accepted me, even though I was different from them. His kiss felt comfortable, like a favorite jacket you never wanted to take off. I knew exactly how the curves of his body fit against mine, and I had the shape of him memorized. Behind us, the warm glow of the Runkerry lights beckoned in the distance. Gazing out over the ocean, I saw a long shooting star burn across the sky. I watched its bright tail reflect off the dark blue water of the ocean. The future was still uncertain, now more than ever. But it was worth fighting for. And somehow I knew, whatever else was coming, no matter how powerful the forces against us, somehow we’d find a way through it. In 2016 I put out some free books. They’ve done well, but now that I’m finishing up some sequels I want them to do better. I don’t think my blurbs are strong enough and I need your help. All you have to do is comment with your rewritten blurb below. I’ll pay $100 for the best blurb to Shearwater Part One and pick ten runnerups to get a postcard. When my parents died in an accident, they left me like a piece of furniture to a grandfather I never knew existed. In Ireland. As if moving halfway around the world wasn’t bad enough, I soon learned my mother had left behind some unresolved drama – dark secrets that were screaming to be uncovered. And then there are the things I can’t explain. Strange things keep happening around me. Happening to me. Is it because of Sebastian, the golden-haired stranger who showed up in town at the same time as I did? Or Ethan, the kid locals whisper plays with dark magic? Maybe both. Maybe neither. But someone is definitely out to get me, and I need to figure out why, and fast… because I’m discovering powers of my own. Powers that I can’t contain. And no matter what I do or who is to blame, if I don’t discover the real reason my mother fled Ireland, more people are going to die. And they’re going to kill us all. Post your revised version in the comments below (make sure your name is visible so I can find you if you win). If you need to read the book first, it’s free on Amazon. Cover reveal! Shearwater got a makeover! Even though almost everyone loves the original cover for Shearwater, I never felt it was professional enough – some of the photoshopping isn’t well done because of the images I used, and I wanted something better. Mermaid books SHOULD be mostly blue, often with a girl underwater – but I couldn’t find any stock photos I liked enough. 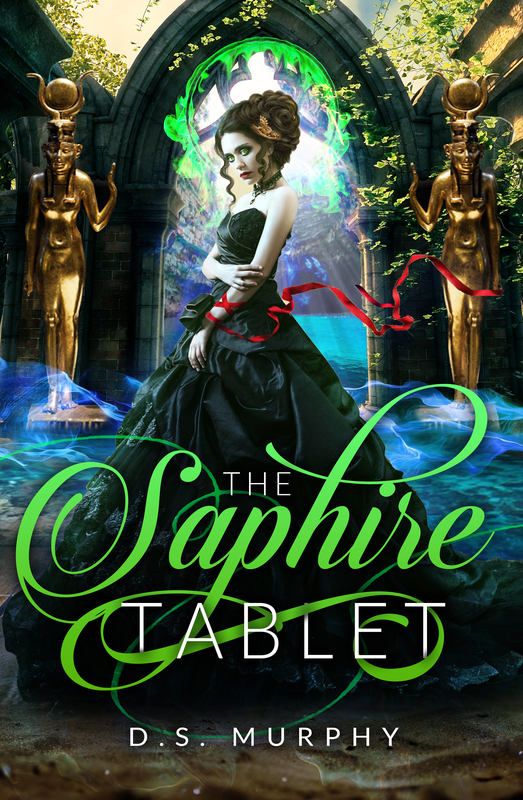 And even though it’s a dark fantasy romance, it’s also an epic fantasy, and a LONG one (the full book is 140,000+ words!) so I wanted something more powerful. Usually when I post cover remakes, everyone tells me they prefer the original, but I think this will work well. I’ll keep the original cover for Part One, which will continue to be free, and use this for the Full Book (Parts One and Two) which will be $3.99. If you’re already on my email list, I will email you when you can get part two for free (as promised). So you don’t need to pay for this book – though I hope you’re review it when it’s ready. However, I will be focusing much more on sales for this one. The more I make with these books, the more time I can spend writing. So if you’d like to support me by preordering, you can do that here. 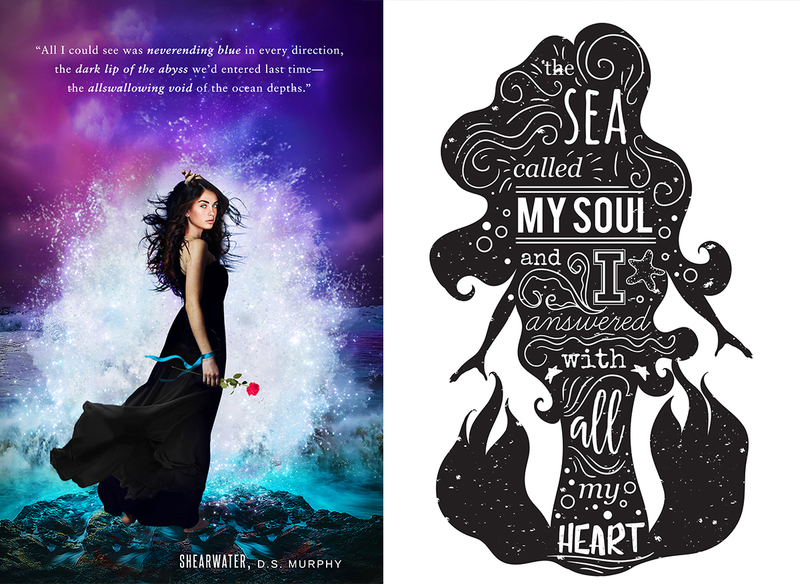 As an added bonus, if you preorder, I’ll send you these two postcards: one of the cover art, and one of a quote that will be in the front of the book. “Part One” of this book was made available last year. This is the first FULL book of the Ocean Depths Series; it includes parts One and Two and is almost 140,000 words long. 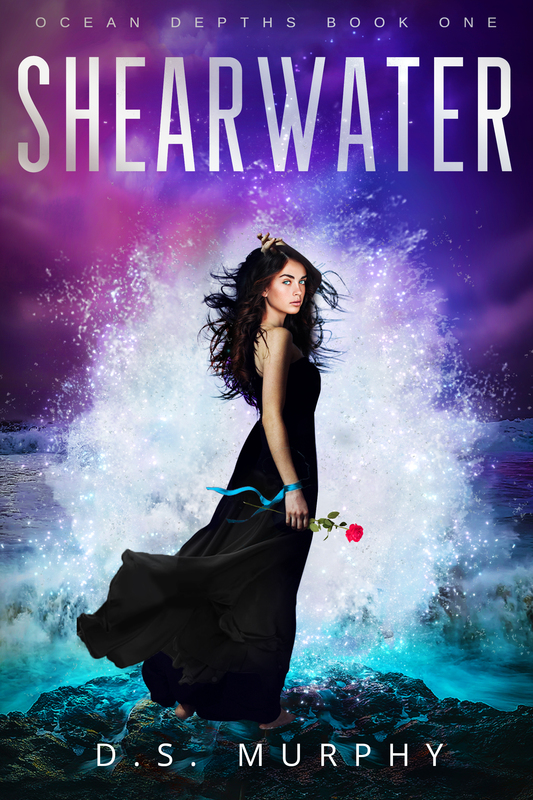 Shearwater is a young adult mermaid novel that will appeal to lovers of paranormal romance, urban fantasy, witches, Irish mythology, supernatural folklore and, of course, mermaids.